Hundreds of patients with a type of advanced skin cancer are set to benefit from a new treatment, dabrafenib plus trametinib. NICE’s positive recommendation applies to adults who have stage III BRAF V600 mutation-positive melanoma that has spread to nearby lymph vessels or lymph glands, which make up an important part of the immune system. Dabrafenib plus trametinib would be given to patients who have already had surgery to remove the tumour and associated lymph glands. Called adjuvant therapy or treatment, it aims to remove any residual cancer left behind. 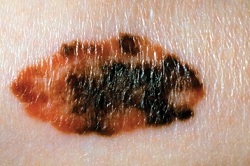 Mirella Marlow, deputy director for the NICE Centre for Health Technology Evaluation, said: “There are currently no adjuvant treatments available for people with stage III BRAF V600 mutation-positive melanoma, a disease which can cause severe and debilitating symptoms. According to company estimates 427 people will be eligible for this treatment. Both drugs are taken orally, dabrafenib twice daily and trametinib once daily. The treatment will be available at a confidential discounted price agreed between NHS England and the company. Current treatment is routine surveillance, which includes regular check-ups and surveillance imaging.